Grand Opening in Culver City! SATURDAY, NOVEMBER 8th! 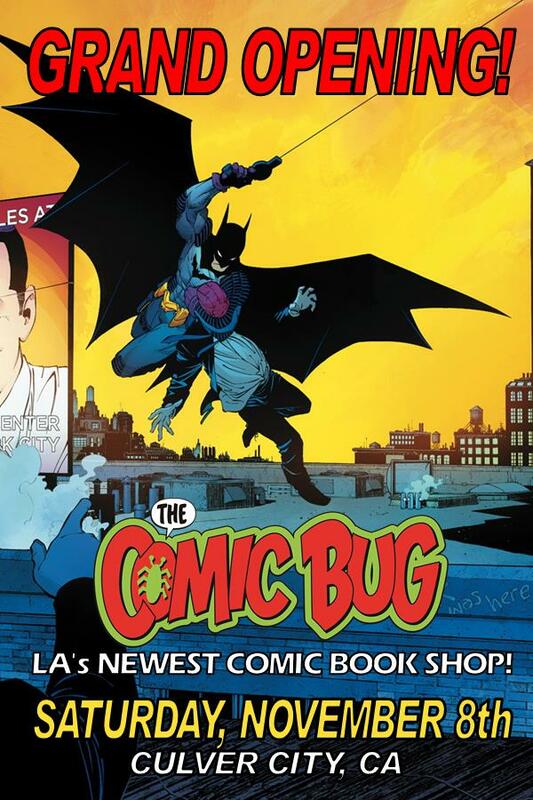 The Comic Bug Culver City is throwing its official GRAND OPENING and what a spectacle do we have planned for you! *DEALS! We're talking buy 2 get 1 free DC, MARVEL & IMAGE TPs. An ENTIRE ROOM filled with 50% OFF graphic novels and TPs, and much, much more! *CREATORS! Some of the hottest comic creators in Southern California will be on hand to meet and greet, sign autographs and provide sketches for you! GABRIEL (Star Wars Legacy, Planet of the Apes, Kinski) HARDMAN, DANNY (BATMAN) MIKI, JOSHUA (HARBINGER) DYSART, RAFAEL (SONAMBULO, GUNS A'BLAZIN) NAVARRO and D.J. (AMELIA COLE, THE BIGGER BANG) KIRKBRIDE will be in attendance to share their love of comics with you! *COSPLAYERS! Witness some of Los Angeles' greatest cosplayers bring the characters you know and love to life right before your naked, steaming eyes! Meet and take photos with WONDER WOMAN, SUPERGIRL, SPIDER-MAN, CASEY JONES and the crew of STAR WARS: REBELS! We'll be joined by Culver City's very own ANGEL CITY DERBY GIRLS who will be rocking and rolling around the parking lot to deliver even more fun and GOODIES throughout the day! I guess what we're trying to say is come on down to The Comic Bug Culver and prepare yourself for an epic day of FUN for the whole family!